Louis Vuitton Foundation and the Jardin d'Acclimatation; let's go! IN TUNE WITH THE WORLD is an incredible new exhibition running until August 27th at the Louis Vuitton Foundation. This fabulous art museum is housed in a building designed by Frank Gehry and built on a mirror of water surrounded by the ancient trees of the iconic Jardin d’Acclimatation. Take the opportunity to discover this newly renovated public park, which now offers and new activities for all ages as well as 18 hectares of walks. IN TUNE WITH THE WORLD features a selection of modern and contemporary works by some thirty artists, many of which have not previously been shown here. This exhibition questions the place of man in the universe and his relationship with the environment and the living world. Using works created in various media, it highlights the relationships between humans, animals, plants and even inanimate objects. 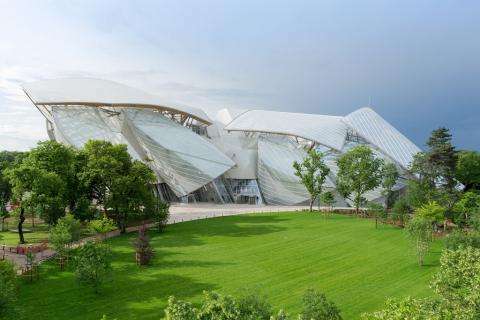 Don’t miss this fascinating exhibition of emblematic works from the Louis Vuitton Foundation collection, only 30 minutes from your Hotel Passy Eiffel. Renewed and more beautiful than ever following months of renovation work, the Jardin d'Acclimatation has now been reopened to the delight of all ages. Some 40 attractions, including 17 brands new ones with a steampunk vibe, await you amidst an old Paris ambiance that will remind you that you’re in the capital’s oldest public park. This delightful green space in the heart of Paris now boasts four fabulous rollercoasters that your teenagers will love. However, true to its DNA, the Jardin d'Acclimatation is still home to friendly animals waiting to meet you at the educational farm, as well as 18 hectares of walks sheltered from the heat of the sun! Don’t miss the Louis Vuitton Foundation and the Jardin d'Acclimatation during your stay at the Hotel Passy Eiffel.